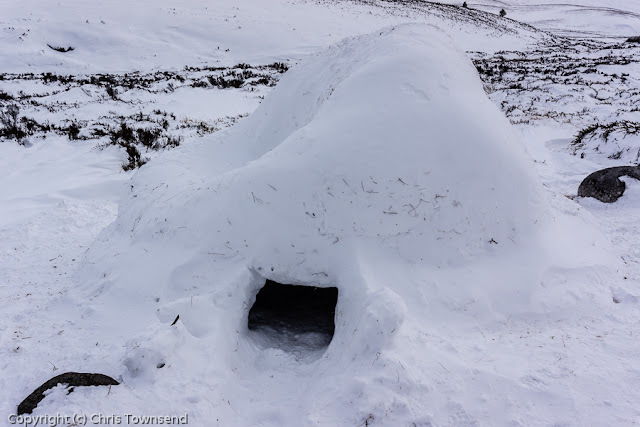 The days following the building of the igloo described in my post for January 19 were stormy with high winds and much snowfall. 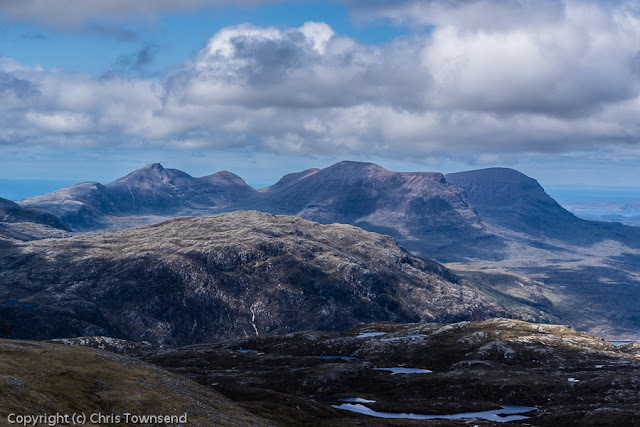 Then on the fifth day came a forecast for good weather – calm, clear, sunny – and I went out to see how the igloo was faring and to climb Bynack More, the nearest high mountain. 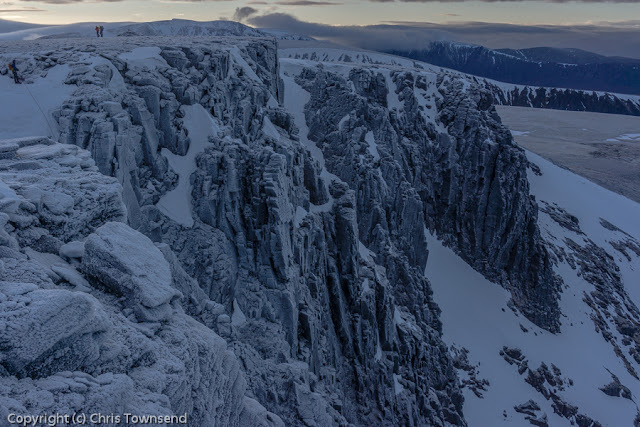 The immediate change from the previous visit was the snow, which now lay deep and continuous. I set off on skis rather than on foot. 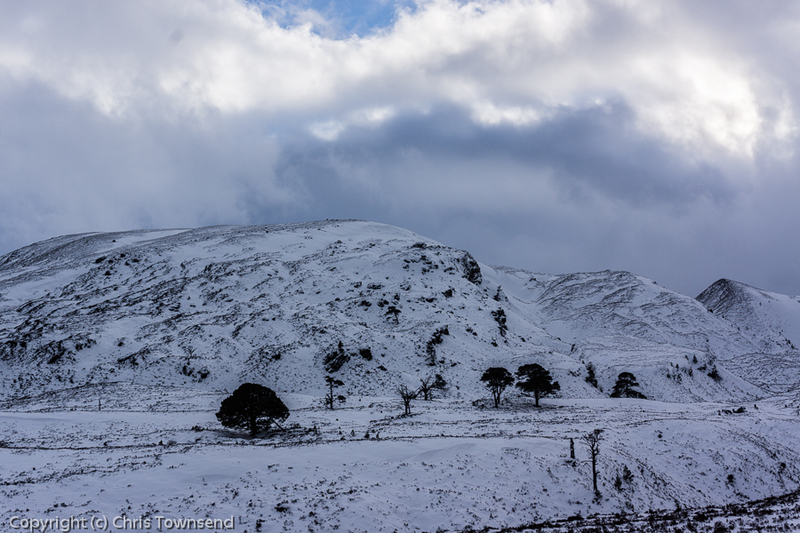 Once I climbed out of the trees I found many big drifts across the track, some of them waist high. Walking would have been hard work. The weather however seemed little different, with a cold wind whistling down from Cairn Gorm and ragged clouds swirling across the sky. There was little sign of the sun. Skiing down the last little slope to the igloo I thought it looked an odd shape. On reaching it I realised that one side was now inverted. This side faced east and I can only assume there was must have been enough heat in the rising sun one morning to cause it to sag. It was now frozen hard. The inside still had room for a couple of people but didn’t look very appealing. I had intended to spend the night here but now decided to ski on with all my gear and maybe camp somewhere else. Above, the very top of Bynack More was hidden in the clouds and I could see spindrift blowing across the slopes. 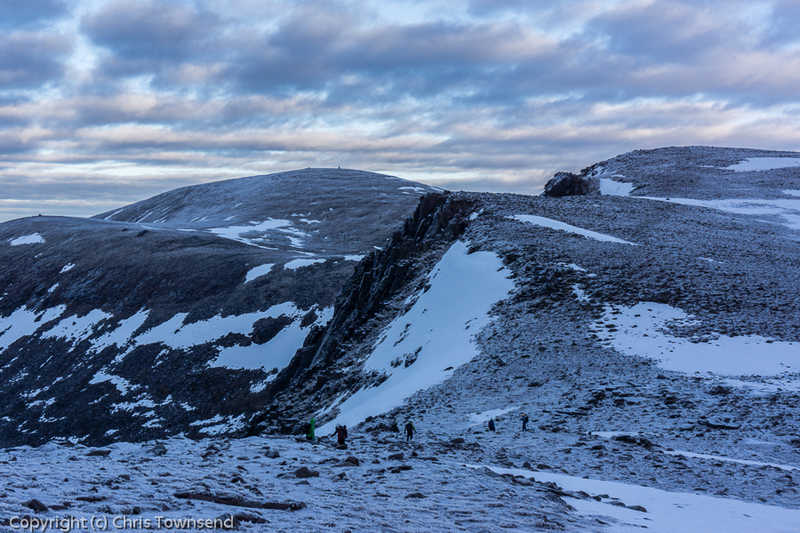 Climbing onto the broad north shoulder of the mountain was arduous as there was much soft snow to cross. The wind grew fiercer and colder. I met a walker coming down, the only person I spoke to all day. 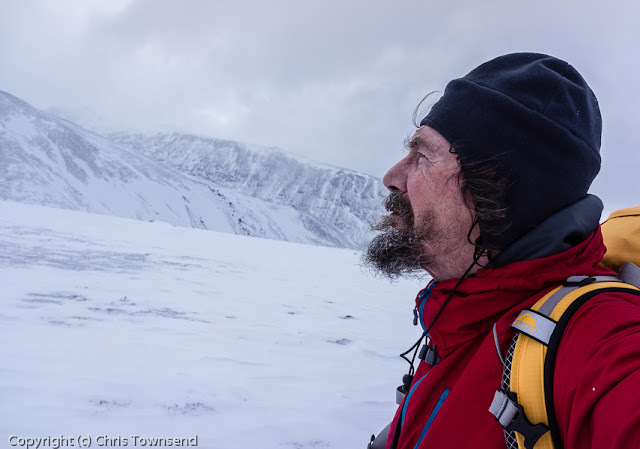 He told me he’d reached the long rocky summit ridge and then turned back as conditions were so atrocious. 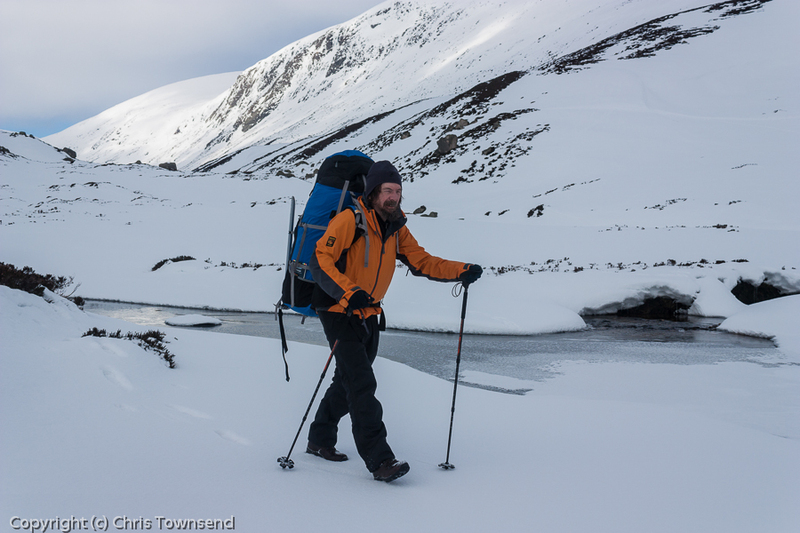 “I nearly turned back earlier,” he said, “as some of the drifts were almost waist deep”. He looked at my skis. “I need some of those”. 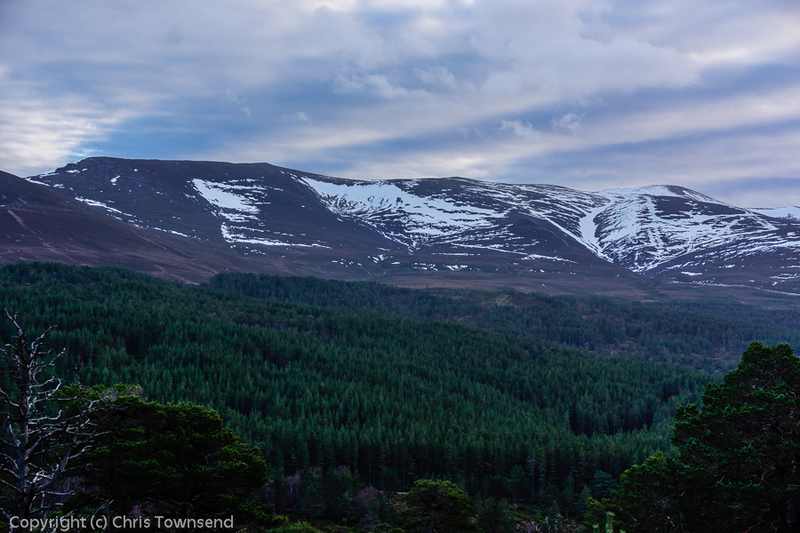 He also told me that there was a surprising lack of snow high up – “it’s all blown down into the forest”. Do I really want to go up there? Looking up I could see large scoured areas of mountainside. Choire Dhuibh, the big bowl between Bynack More and its lower neighbour Bynack Beg that is the best ski route both in ascent and descent, only had patches of snow. I would have to walk some sections, which wouldn’t be very comfortable in my plastic ski touring boots. Carrying skis in strong winds isn’t that easy either. I continued across the shoulder to the base of the corrie and the northern ridge of the mountain. Clouds were still covering the sky and the summit. The wind was tearing at my face. It would be arduous going higher up, probably for little reward. My will wavered and I knew this was as far as I was going. 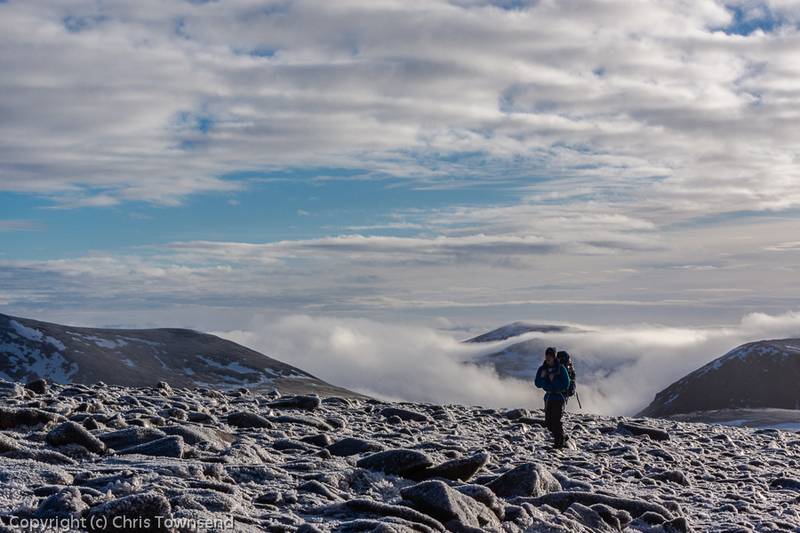 I’d been up Bynack More many times before. 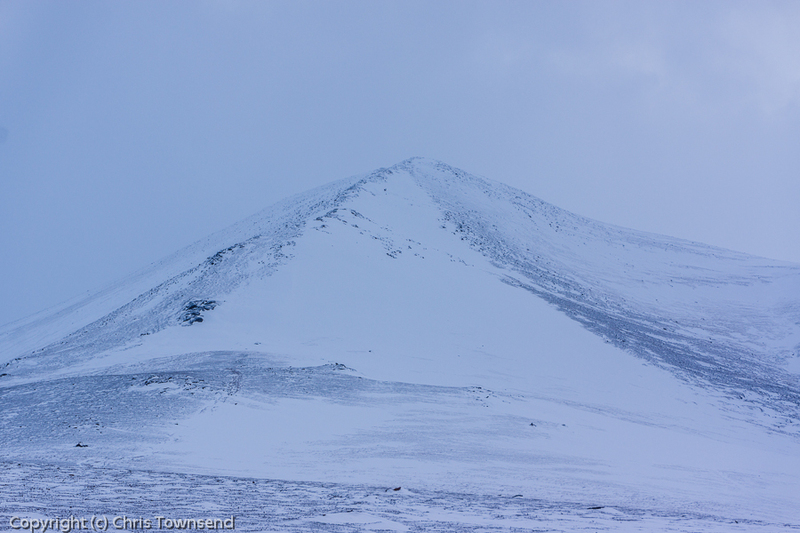 But today was not a day for the summit. Turning I skied back down to the igloo. The snow was firm at first, making for fast, easy skiing. Lower down it was softer and my skis broke through so I slowed down and took care with turns. At the igloo I made a second decision. 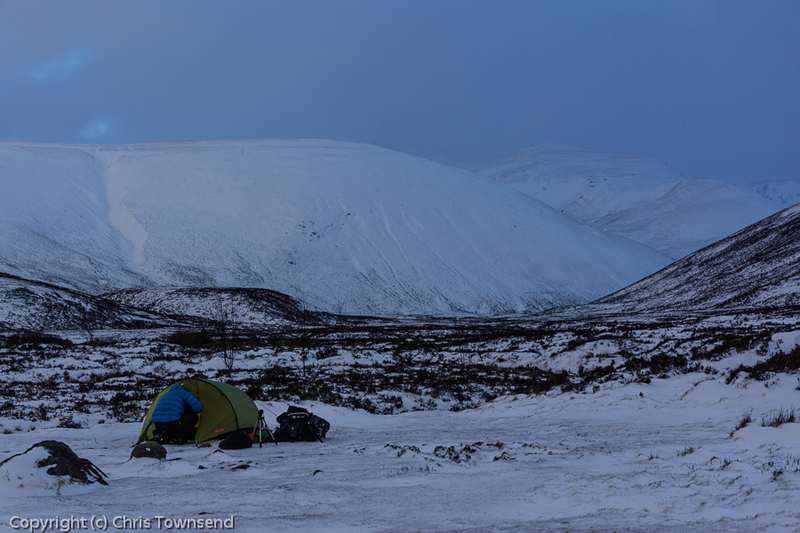 With a forecast for stronger winds and heavy snow coming in overnight I decided not to camp but to head out. So then it was back along the track in the dusk watching a hazy moon coming and going in the racing clouds. The first igloo and first camp of the year plus the first filming for the Cairngorms in Winter project all occurred in the past two days. TerryAbraham had already been out for several days filming in pretty severe conditions when we met up in Aviemore. As the forecast was for more stormy weather with high winds and snow we decided on a low level forest and moor route rather than venturing on the high tops. We also combined our filming trip with an igloo building one consisting of outdoor writer Phil Turner, owner of a brand new Icebox, Helen and Paul Webster from Walk Highlands and outdoor blogger David Lintern and Tanya. The prospects of building an igloo didn’t look good as we wandered through Glenmore Forest past frozen Lochan Uaine to Ryvoan Pass, as there was less snow than expected. 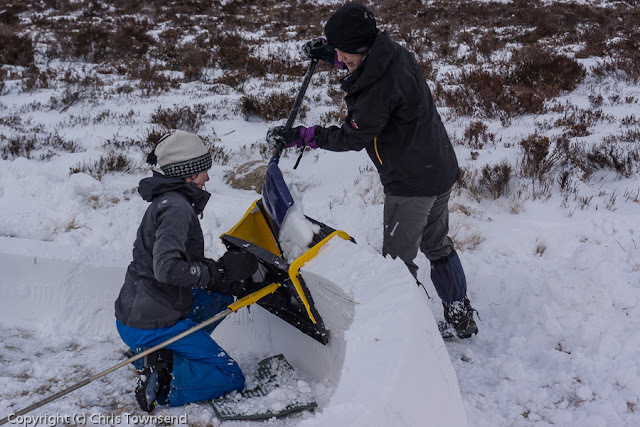 However when we reached Strath Nethy we found a good flat area for the igloo and soon realised that the snow in the surrounding heather was quite deep. We just had to get it to the igloo site. This was achieved with the use of survival shelters, a really good idea (not mine I must admit). 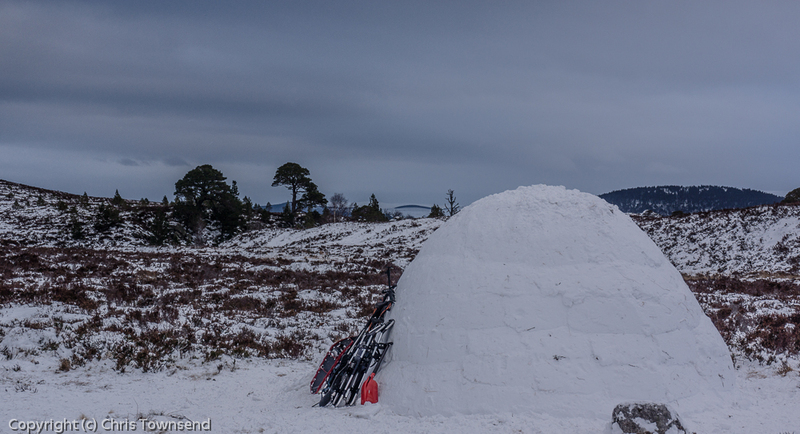 I’d not built an igloo on just an inch of snow before – and I was the only person there who’d ever built an igloo. All previous igloos had been on deep snow. Making a door would be interesting, I thought, as this would have to go through the igloo wall rather than under it. First though the igloo had to be high enough to need a door. 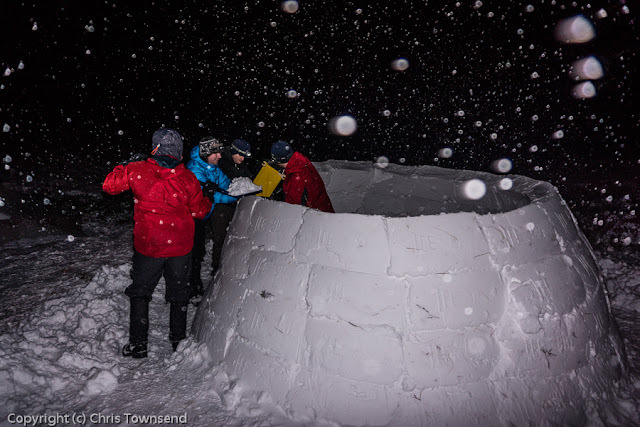 With five people intending to sleep in the igloo it needed to be big (Terry and I were camping). And big it was, growing upwards and upwards and upwards. Soon even the six footers amongst couldn’t reach into the Icebox to make blocks. 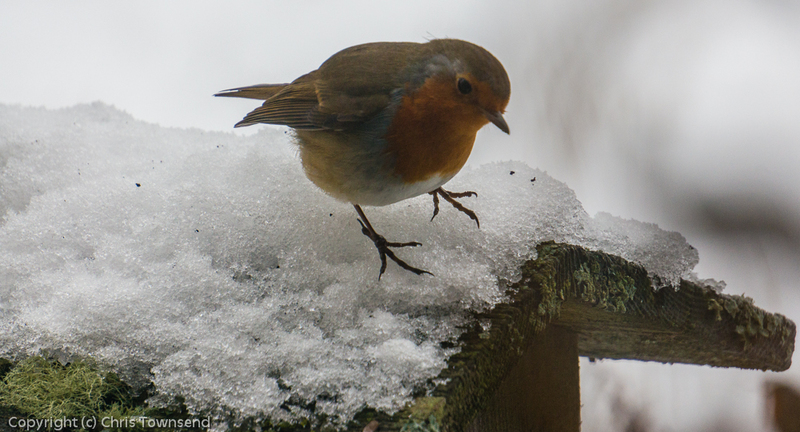 A rubble sack full of snow solved the problem though standing on it did require good balance as it slid around on the icy ground. Falling through the igloo wall would not have been popular. As the igloo extended into the sky night fell and with it came wind and snow. Headlamps flashed, warmer clothing appeared and still the igloo grew. The time came for a door to release Phil from the inside. I extracted the snow saw conveniently located in the handle of my shovel and carefully cut a small door, cautiously pushing out little blocks of snow. The igloo stayed intact, a great relief. The igloo was finally completed in a rather unorthodox manner by Paul and Phil, who were, unfortunately for them, the tallest amongst us and thus the only ones who could reach the top even with the aid of the rubble sack. At one point Paul was holding up the Icebox with his head. Finally the last snow was patted down. The igloo was complete. And it wasn’t even midnight. A quick celebration inside with some nice whisky then it was time for a very late meal followed by welcome sleep. 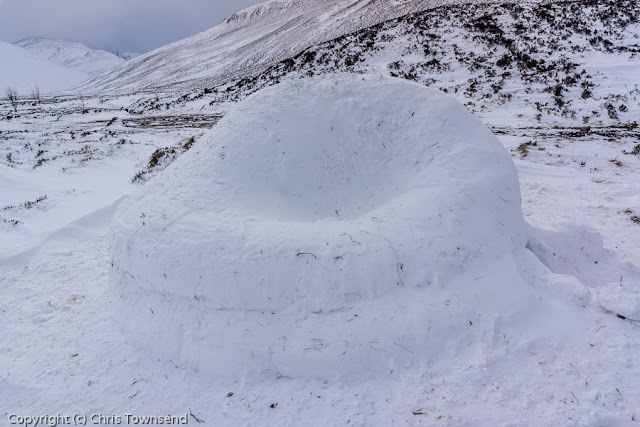 The snow had faded away as the igloo neared completion and little fell during the night. 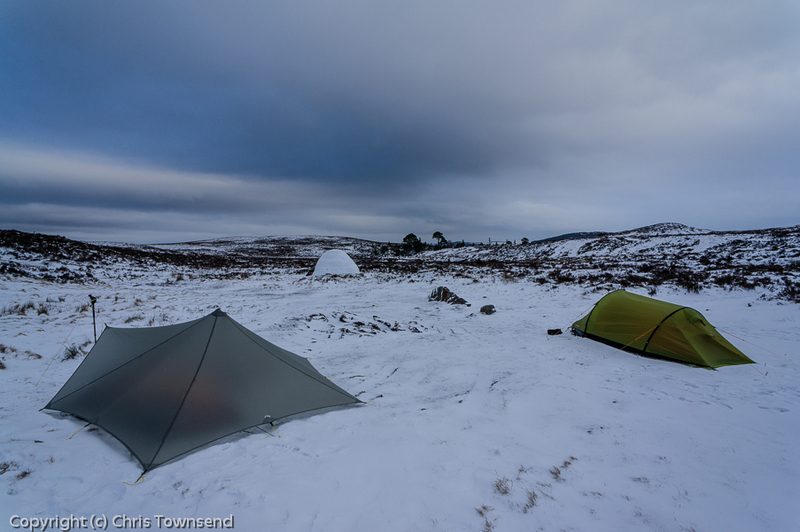 The lowest temperature in my shelter was -2.6C. It would have been warmer than that in the igloo. 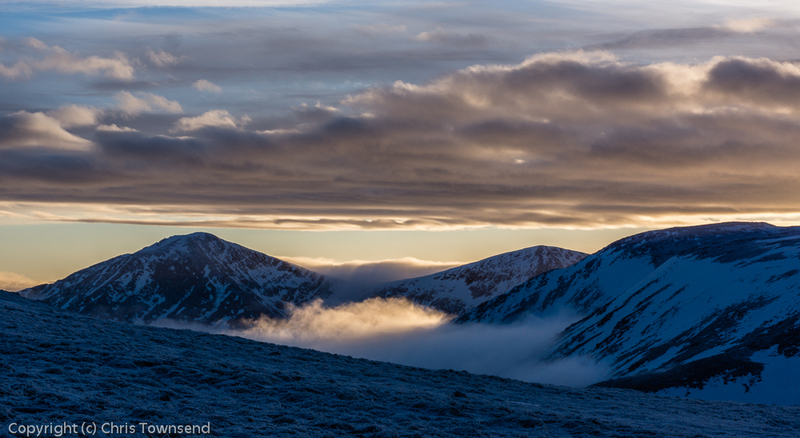 The sky was patterned with layers of cloud which hid the highest summits. A chill wind swept the campsite. The igloo five set off for a forest walk. Terry and I headed back to Ryvoan Pass, discussing filming to come. It had been an interesting two days. 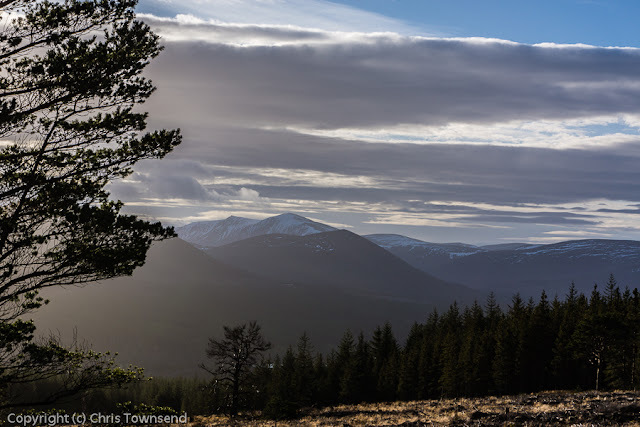 Terry Abraham's Kickstarter funded Cairngorms In Winter project has begun. 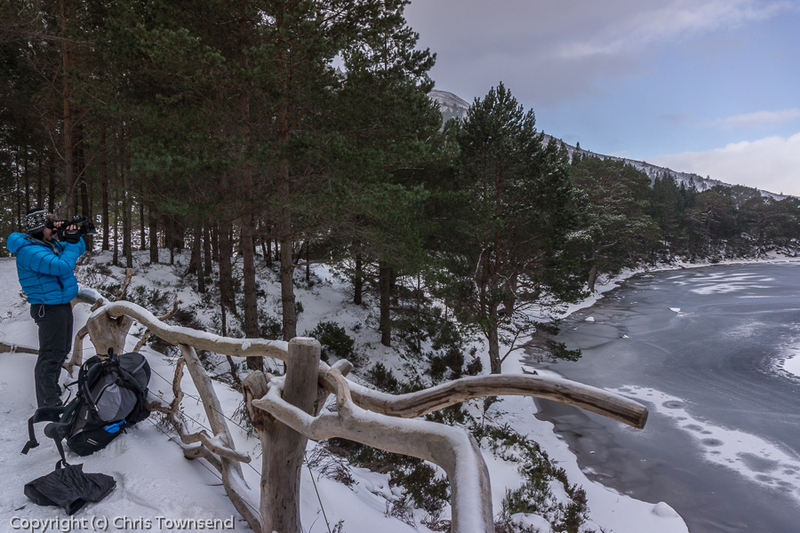 Terry has been up in the Cairngorms the last few days learning just what wintry conditions can be like here. 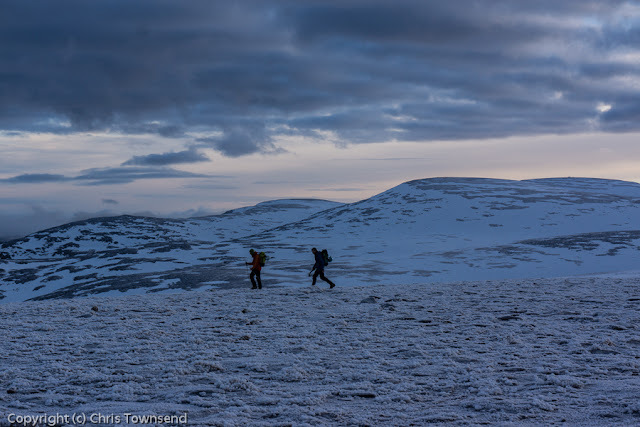 He's already had to deal with strong winds, spindrift, snow and difficult terrain with snow hiding the rocks - a typical Cairngorms winter week. Added to that has been a deflating air bed and a gas stove reluctant to work in the cold plus a 30kg pack full of video gear. 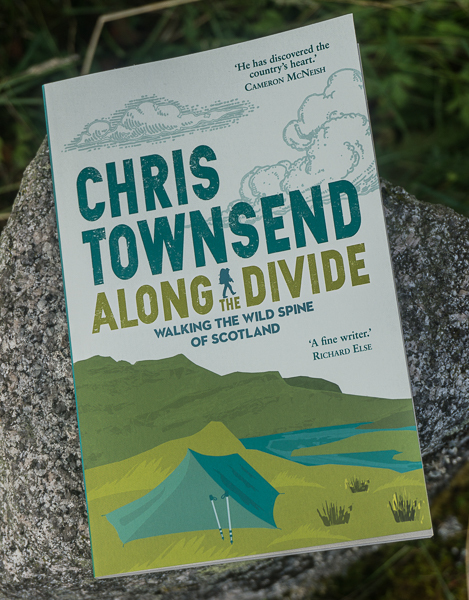 Having progressed along the northern edge of the mountains from Cairn Gorm to Cairn Lochan with two high level camps winds strong enough to blow him over and a weather forecast for blizzards persuaded Terry to leave the hills for a camp in the forest, where the wind is still strong. Here at 300 metres and some 20 miles from the mountains the winds were gusting fiercely when I took the above picture. 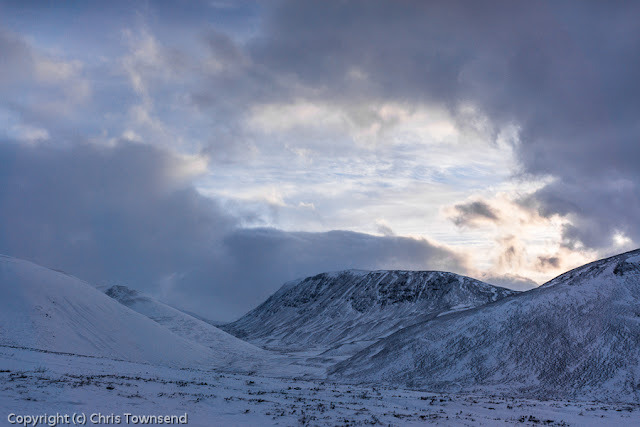 I'll be joining Terry in a few days time for some filming - probably in the glens and forests given the forecast. I'm looking forward to it. A couple of years ago I wrote a piece for TGO magazine on the delights of night hiking, something I do often at this time of year. For two very different reasons I’ve been reminded of this piece and have decided to post it, slightly edited, here. 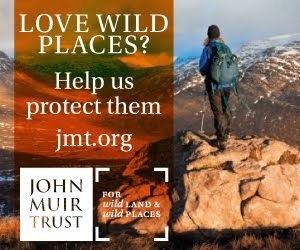 The first reason is that this autumn and winter there has been a string of stories about walkers needing rescuing because they’ve been stuck in the dark without a torch. Maybe it’s just that they’re reported more often but it seems to me that there have been more of these incidents than in other years. Now, hiking without a torch or headlamp is indeed foolish, as mountain rescue teams repeatedly point out. I carry one year round. However most of the rescue stories make the assumption that night walking is to be avoided if at all possible. I disagree. Walking in the dark is part of the whole outdoor experience and something to be relished not feared. The second reason is that for the last three nights I’ve been watching the excellent Stargazing Live on the BBC and have been inspired to go out and watch the night sky. On two of the evenings the sky was clear and after the programme I went out and looked up at the great winter constellation of Orion, the brilliant planet Jupiter and the myriad stars of the Milky Way and thought with astonishment of how much we know about this unbelievably vast universe and how we are slowly exploring it. Anyway, here are my thoughts on walking in the dark. 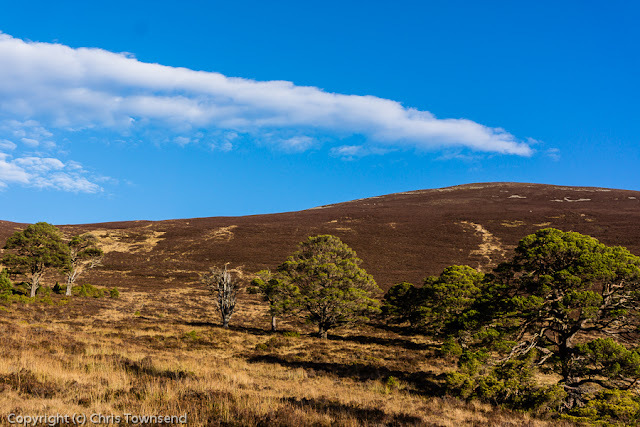 Early in the autumn of 2011 I was camping high in Coire Garbhlach above Glen Feshie in the Cairngorms when I was woken by a powerful gusty wind shaking the tent. Reckoning I would get no more sleep and knowing it would be light in an hour or so I packed up and set off into the black night. Slowly the darkness started to resolve itself into shades of grey. The hills were almost black against the slightly lighter overcast sky. The ground was mottled, tussocks of grass pale, clumps of heather dark. I could see just enough to walk without my headlamp, though I did stumble a few times on the uneven ground. Once my eyes had adjusted to the dark I began to enjoy being out in the night, out in a mysterious world that held the promise of innumerable possibilities. 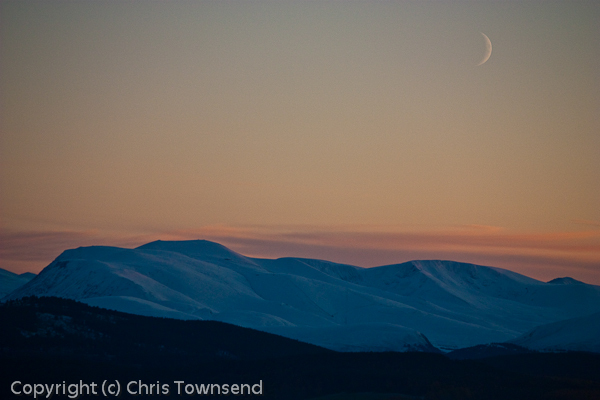 The coming of dawn, with flat light and a grey sky, was a disappointment. The world was ordinary again. 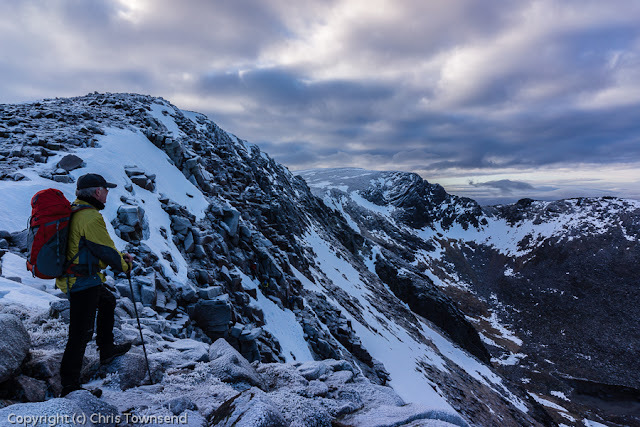 Having walked in the night many times I wasn’t concerned at the idea of hiking down the rough corrie in darkness though I knew I would need to take care and progress would be slow compared to daytime. Time passes differently when walking in the dark anyway. The concentration required, even on easy terrain, means that the minutes flash by unnoticed. This is when walking without a light. Once you switch on a torch or headlamp you are locked into its beam. All that exists beyond that cone of light is blackness, broken only by faint silhouettes of trees or hills. Inside the light the world is familiar but it is so small and restricted that I find it confining and much prefer to allow my eyes to adapt to the dark and to walk in the night not apart from it in an LED bubble. Only on the darkest nights or in the densest forests do I use a light when walking. I always have one handy though so I can switch it on if I walk into a black space under a tree or boulder and suddenly can’t see. I may need it to check the map too. Whilst a light does affect night vision a little I find my eyes recover in a few minutes if I only have it on briefly. 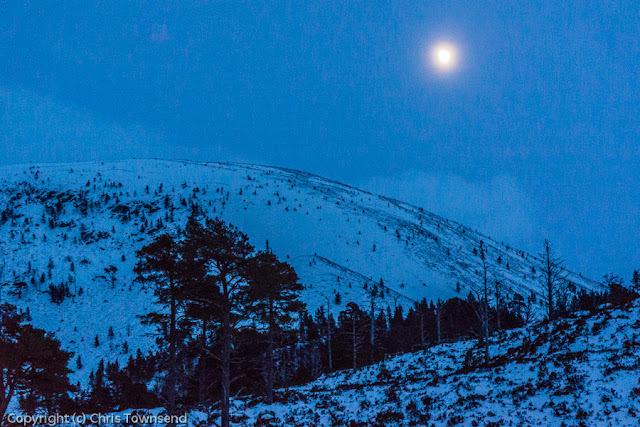 When there’s a big bright moon a light may not be needed anyway, especially on open terrain where the ground is visible though rather pale and eerie and you can see faint shadows. Walk into a forest however and the bright moon can be a problem. 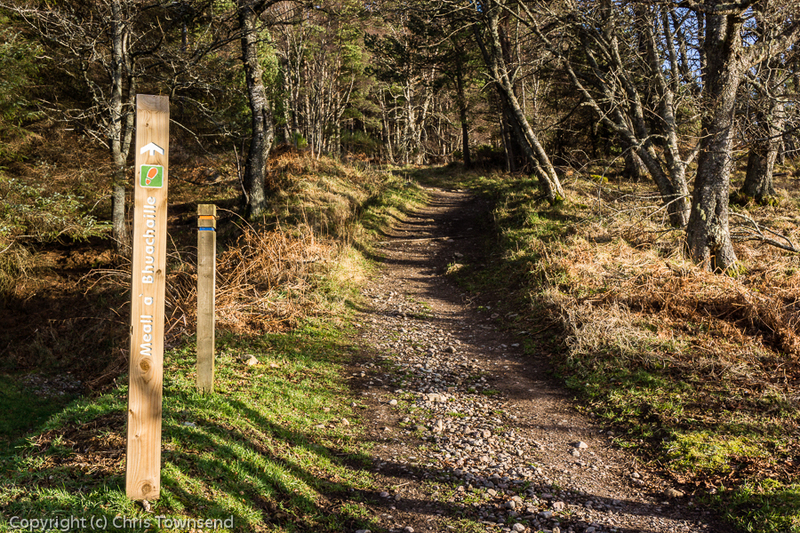 Where it shines in open glades and meadows the walking is easy. But as with the light from a headlamp outside the moon’s light all is black and invisible. I sometimes use a light more walking under a full moon than on a moonless night. Walking under a bright moon is wonderful though, with the landscape a shadowy reflection of its daytime self. The yellow-white light shines off pale rocks, birch bark, pools of water and anything light –coloured so they shimmer softly. Shadows are solid black with no detail – anything could be in them. Lit areas are cool, bleached of colour and tone. The world is lovely and mysterious. When there’s no moon and the sky is a brilliant mass of stars walking is harder, not because you can see less but because that great canopy of the universe is distracting, luring the eyes upwards to gaze out into the infinite. I stop frequently then to star watch without risk of falling. At other times the sky is overcast and holds little of interest unless the wind tears the clouds apart to reveal a solitary star or planet, suddenly bright and sharp in the black sky, or a half-hidden moon. Mostly, though, an overcast sky brings the eyes down to the landscape, to the dark columns of trees and the unusual shapes of boulders. 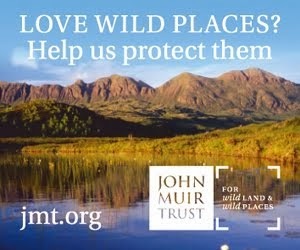 Whilst there is much more to see at night than is imagined by those only used to lit streets and buildings or who always use a torch or headlamp one of the joys of night hiking lies in the amplification of the other senses. Hearing becomes much more acute. Tread on a stick and the crack as it snaps sounds like a gun shot. The rustle of a mouse in the grass sounds like a deer is crashing through the undergrowth. (This loudness of sounds makes night hiking in bear country, which I have done quite often on walks in North America, interesting. 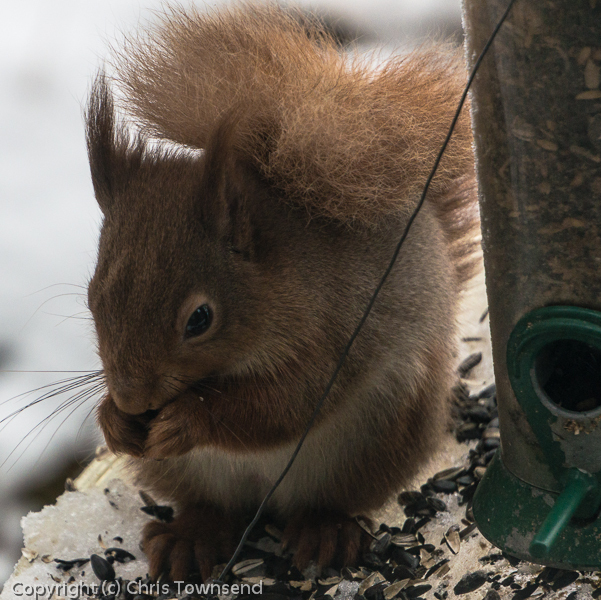 Concentration and stillness is required to adjust sounds closer to daytime reality and realise that a bear would be making much more noise and it’s a small rodent you’re hearing). The sense of smell is stronger too. I’ve often smelt the rankness of a deer or the sharp stink of a fox without ever seeing the animal. The aromas of trees and vegetation are distinctive and sometimes I can identify what plants are around me by the smell. 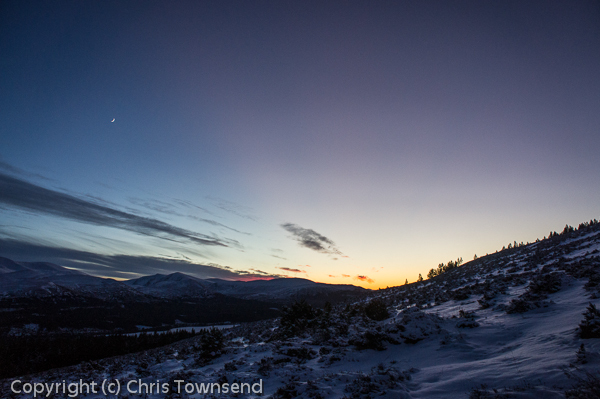 Sometimes night hiking is unintended, as in the anecdote with which I began this piece. Often though I set out to walk in the night, especially in the winter months when darkness is long. 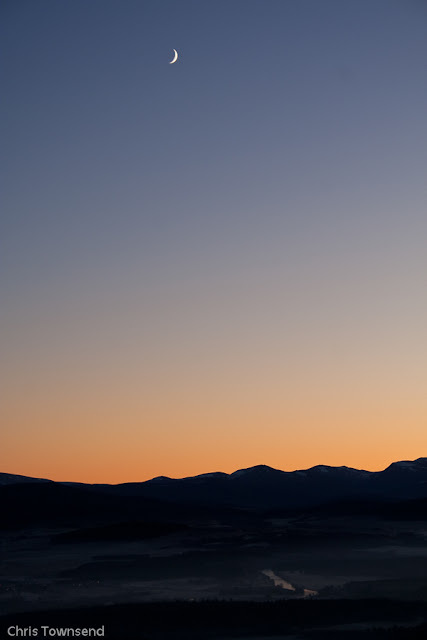 Rather than cram as much as I can into the seven or eight hours of daylight I set off before dawn and walk long after sunset. Because finding a camp site in the dark can be difficult I usually select an area in advance where I know there will be some suitable ground and then cast around for the best area when I reach that spot. This doesn’t always work out in unknown country though. On the Pacific Northwest Trail last year I lingered on a summit to watch a dark red sunset. From the map I thought there should be flattish ground and water not far from the top. But the trail led down a broad ridge with nowhere to camp and no water. An almost half-full waxing moon appeared in the sky followed by a single bright star. I followed the stony trail as it zigzagged down, just able to see it against the darker undisturbed ground either side. Below a ragged edge of dark forest rose to meet me. Once in the trees I was in and out of the moonlight and the walk became hypnotic as I descended thousands of feet for several hours before finally reaching a meadow and a creek. 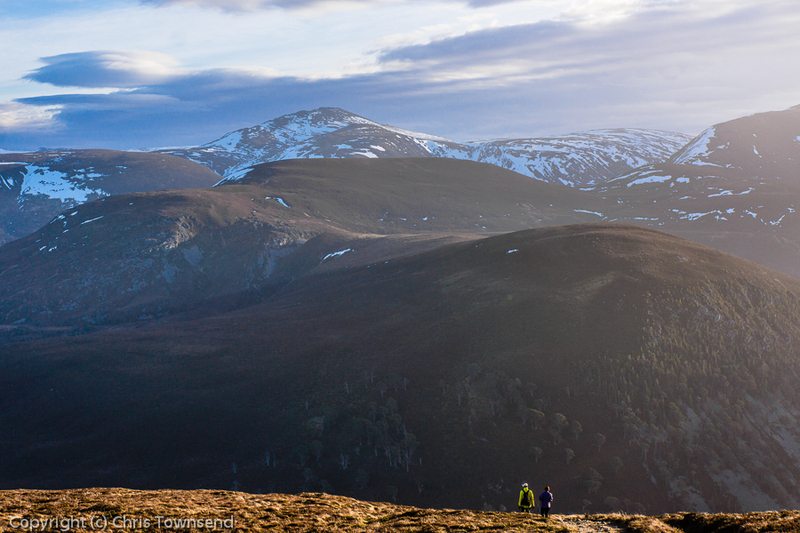 It was a glorious descent and tired though I felt I was glad I hadn’t found a camp site any earlier.